At a global level, the venture capital ecosystem is slowing down. The later stage VC space has continuously attracted larger investment rounds, as seen by the surge in average and median values. In the last few years, we have seen how elusive aggregated statistics have been. 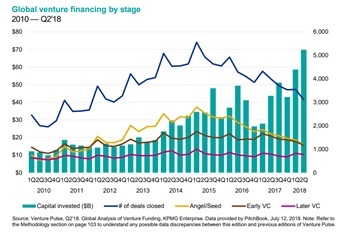 We are running the risk of focusing too much on the consistent increase in Capital Invested, and perhaps less so on how the distribution between Angel/Seed, Early and Later Stage VC groups. Ecosystem players should have realised by now that the pre-revenue seed companies are at a complete disadvantage, as most of the funds created have gone upstream, de-risking their investment thesis. Equally, we see a dry-up of capital flowing to early ventures, leaving entrepreneurs in a fight for their survival. There is no safe geography, as most funds have now global or regional mandates. Europe and the UK present the same trends we see worldwide, although the causes for the relative market correction may differ. There are multiple reasons we are observing an early stage pullback. First, a majority of funds invested at Seed level are those of private individual investors. In the UK, utilising SEIS and EIS tax claims as a proxy, we find that over £1.2bn were invested. 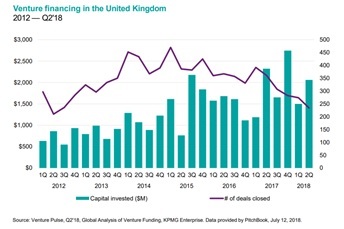 The politico-economic uncertainty in Europe and the volatility and risk attached to early-stage ventures, has shifted the appetite of angel investors. Second, the UK ecosystem is highly competitive, leading to an increase in the way rounds are priced and companies valued, at least, by comparison with the rest of Europe. It means that VC investors can get more value for their invested capital, provided they shift interests to the continent. Considering that funds will not necessarily have a tax benefit flowing through, the transition seems economical not just logical. Similarly, in other fully-priced markets, we find that the valuation hype has led to both some investors being priced out, coupled with decreasing confidence on the ability to realise the returns multiple envisaged. Third, following from the last point, between 2013 and 2016 we observed an exuberant investment attitude, which consequently led to the creation of abundant investment portfolios, most of which are due to mature. It could be the expectation of return that might have driven some investors to reconsider their allocation of capital to VCs or forced them towards other asset classes. Expectations and reality, especially when we find ourselves in a bubbling ecosystem, are hard to reconcile. The backbone of the early-stage business has been the capital of angel investors, which like any other type of investor expects a risk-adjusted return. In this ecosystem, however, we find a surge in failures, fewer acquisitions, and, the ultimate evil, an ever-changing appetite guiding the decision of Series A funds. It is not the lack of capital at Series A and beyond that creates a bottleneck in our ecosystem, only the natural dynamics found in most markets, that of demand and of an abundant supply.